Today, baby co sleeper beds are the best and safest way to keep your baby close to you, while keeping you comfortable in your own bed. Baby has her own safe area that you can’t roll into. You are close enough to take care of her every need. Baby co sleepers are perfect for newborns . 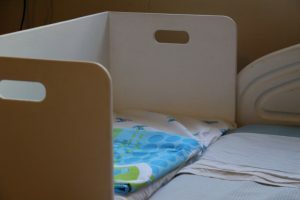 Co Sleepers are usable until the child gets mobile or begins sitting up at approximately 6 months of age. 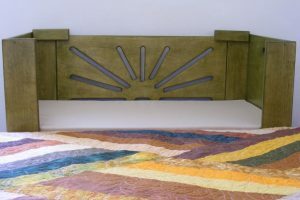 Being a woodworker and a grandmother, I have made several variations of co-sleepers. Many new moms want this sleeping arrangement. 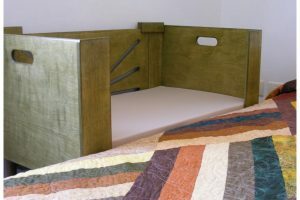 Etz-Ron’s s fold away baby co-sleeper bed attaches to the side of the bed. 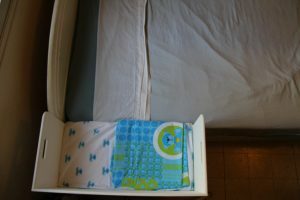 Or it can be a newborn free standing crib/ bassinet. 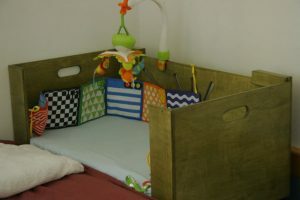 With four sides, the unit folds down for compact storage when it awaits the next new baby. 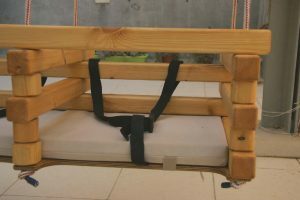 Furthermore, the co sleeper can be placed on the floor, or on a custom built base, with one side folded in to use as a child size sofa or doll bed. 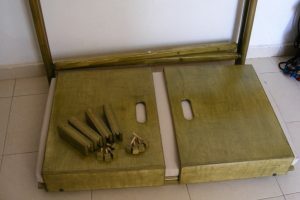 The leg assembly can be customized to every bed height and of course, paint color is optional. Save money by doing your own painting. 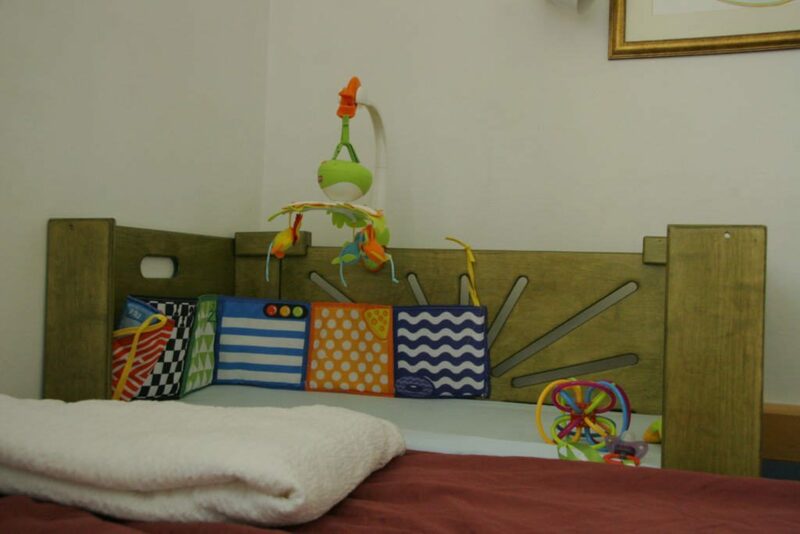 Etz-Ron’s bedside co sleeper hooks over the mattress lip on the bed. 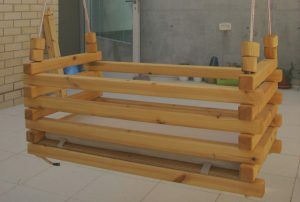 It is further supported by a set of adjustable legs on the outside of the co sleeper. There is ample place to lay the baby down and keep her nearby. The co sleeper stands on it’s base when not hooked on to the bed. 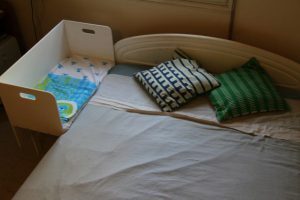 It can also be pushed against the wall to keep baby tucked in safely. This one is made from quality plywood painted white. 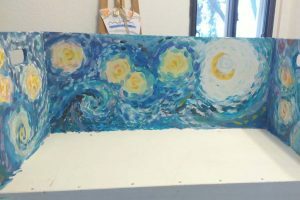 You can also see a photo of the bedside co sleeper painted by artist and new mom, Lucy Wayne. 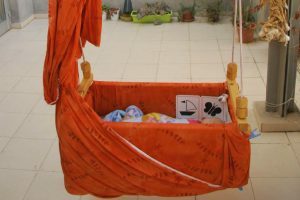 Etz-Ron’s convertible bassinet/ double swing is both a baby bassinet and and a double swing. 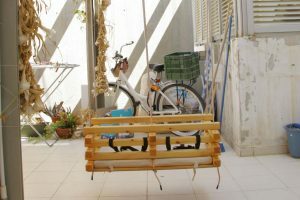 It can be used both indoors and outdoors. My oldest grandchild virtually lived in the swing as a baby. The swinging motion is a great soother for babies. As soon a she could sit, we reconfigured the bassinet into a double swing. That’s more fun for her and a friend to swing on. She still loves to swing. If you are a DIY -er, you can purchase the plans to make it yourself, or order from Etz-Ron.